There you go! It had to happen! 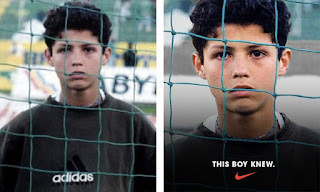 After winning the Champions League final for a second time back to back, Christiano Ronaldo seems to be wearing Adidas in new Nike ad. The swoosh was added on an old photo of the star when he was wearing a sweater by the chief competitor of Nike - Adidas. I guess this ranks up there in terms of embarassment with the photo below which dates back to circa 2002 back when people used to actually forward photos by email (kids this is way before your time!). 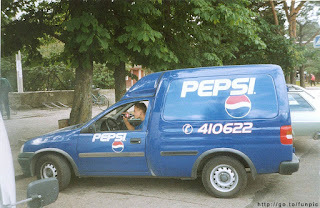 A Pepsi van driver drinking Coke!